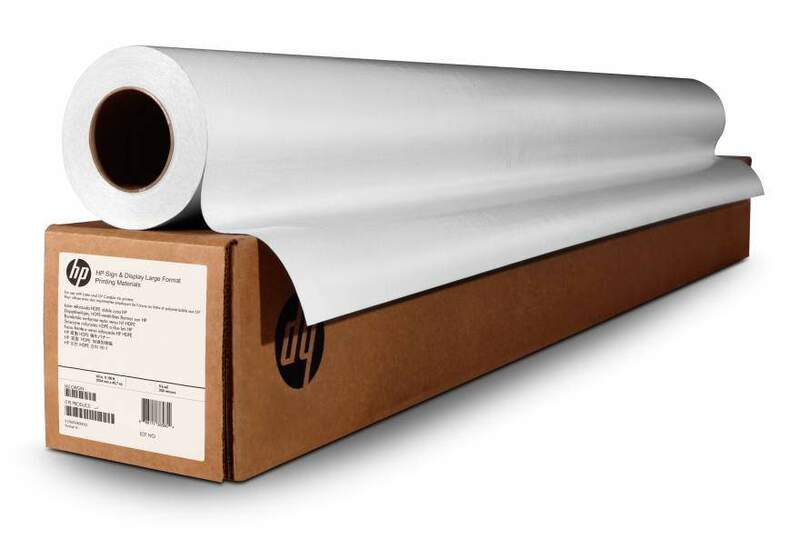 When the job calls for vibrant, glossy prints full of brilliant, photo-realistic images, choose this versatile self-adhesive poplypropylene film compatible with both HP dye- and pigment-based inks. Produce a wide range of indoor and outdoor applications. And help speed your production process - prints dry instantly, and this smudge-resistant, easy-to-handle film features a permanent self adhesive that enables secure, reliable mounting. See over 35 years indoor, unlaminated display permanence. Produce POP, retail, and event displays full of vibrant color and brilliant, photo-realistic images. Together with Original HP inks, this material gives you a wide color gamut and excellent gloss uniformity for smooth transitions and crisp detail.Help keep your production process moving smoothly. Instant-dry, smudge-resistant prints are easy-to-handle and feature a permanent self adhesive for secure, reliable mounting.Take advantage of this versatile material, compatible with both HP dye- and pigment-based inks. ICC profiles help you get the right color, right away. Indoor prints provide over 35 years unlaminated display permanence.